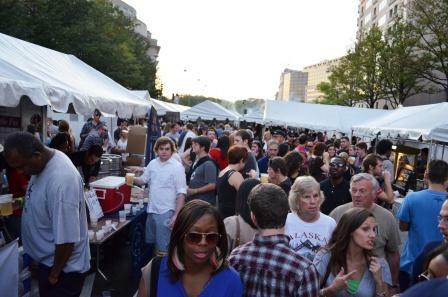 Week 40 of Reed’s Year of Volunteering: Taste of D.C.
Columbus Day weekend delivered quintessential fall weather here in our nation’s capital. Bright sunny days that gave way to stark autumn evenings. And if you walked down Pennsylvania Avenue– just a few short blocks from the White House – you would have smelled the aromas of gourmet food and heard the sounds of live music echoing off the governmental walls that line the street. That’s right; it’s the Taste of D.C. festival. And after a bowl of Ben’s famous chili or a mouth-watering plate from SÂUÇÁ you might need something cold and refreshing to wash it all down with. Look no further than the Craft Beer & Wine Pavilion. Dozens of craft breweries and wineries were set up to give visitors a taste, literally, of some of the most refined libations around. I actually worked a shift for Stoudt’s (you might remember them from Day 77 of my Year of Giving) and helped the small craft brewer introduce their brews to the palates of Washington. The beer pavilion is run by a handful of staff from the breweries themselves with the help of a small army of volunteers. Unfortunately that small army was really small and the tent would go through periods where it was severely understaffed. So I decided to go back the next day and help them out. After all a portion of the proceeds went to DC Central Kitchen, Bread for the City, Luke’s Wings, and the American Red Cross – all really good organizations. So there I was for another shift, pouring beers and answering questions about the subtleties of the different malt beverages. “Either I’ve had too many or I think I taste something like those little banana flavored Runts candies,” a bearded thirty-something guy told me as he smelled and resampled Stoudt’s Heifer-in-Wheat, a Bavarian style Hefeweizen. Well, he very might be more sober than you think. No, the beer doesn’t have Runts candies, but you get some of that fruit flavor from the German yeast that is used. It’s also got a sweetness about it thanks to a generous amount of malt that goes into the brew. Although not my favorite of their 15 or so beers that they make, on a warm autumn day it’s perfection.